Book your event at Del Mar Plaza! The perfect event starts with the perfect location. What’s more romantic than a wedding in a gorgeous setting with stunning ocean views? Del Mar Plaza has a special, magical aura that sets the scene for the best event imaginable. From its central location in the heart of Del Mar Village to the sounds of the waves and the cool breeze from the Pacific Ocean, Del Mar Plaza offers an unparalleled experience you will cherish forever. 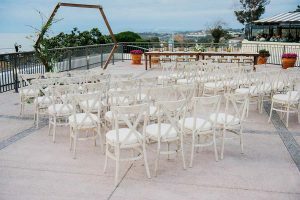 Roughly 8,000-square-foot deck with a panoramic view of the Pacific Ocean, perfect for wedding ceremonies, cocktail receptions, fashion shows, a seated banquet, concert or any other event you can dream up. 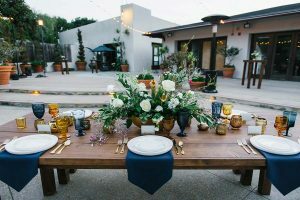 A secluded venue surrounded by greenery, ideal for smaller ceremonies, baby or bridal showers, a private dinner, cocktail party or other intimate get together. Live music and DJs are allowed at the Plaza, though music must cease at 10:00p.m. for the Ocean View Deck and 9 p.m. for the Canyon View Deck. All music must stay below the City noise ordinance due to the Plaza’s location near a residential neighborhood. The use of the Plaza’s venues will require a $10 permit from the City of Del Mar, to be submitted at least 30 days before your event. Additionally, a one-day permit from the California Department of Alcoholic Beverage Control (ABC) will be required for any alcohol served onsite. The Plaza’s event team can provide additional information on both of these permits. Want to have your party, event, wedding, or reception at one of Del Mar Plaza’s wonderful restaurants? Get started by contacting the restaurants directly and they will help you through the process.